My speedo is not working. Originally i thought it was the speed sensor on the transmission, the problem was once the car warm up the speedo just stop at 0km/hr. So when i start it up in the morning and drive it out it would work for about 5km then it stop working. It was like this for last couple months. So today i went to replaced the speed sensor on the transmission with a new one from Honda and the speedo is working again. But it only worked for around 100km, now it stopped working again. I noted the meter below counting the mileage still working so the speed sensor is working for sure. It seems there is something wrong with the speedo circuit board, i would like to you know if anyone have this experience and how to fix it. Thanks. Kaz may be able to shed some light on this for you. Thanks nobby! I know Kaz is an expert, i am hoping he could offer some help. Report back, so i start it up this morning and drove it for like 15 mins about 15 km without any issues. What could be the issues causing the speedo fail after the car warm up? Thanks! modification is done to the circuit board. did that also happened with your old speedo, or only when you installed the NSX-R one? I have the NSXR gauge installed for 3 years, drove about 6000km on the gauge. The problem only developed in the last few months. I used the dial on the speedo circuit board to re-calibrated, i can not say it is 100% accurate but it is close. I do know that the Europe Version NSX come with 280 km/hr speedo which match the NSXR perfectly but it is very difficult to find it. Thanks! in that case, the problem can be in the circuit board itself. The sensor driving the speedo is called VSS (Vehicle Speed Sensor) and as you found, it is mounted on the gbox. It's driven by the thin metal plate/ring on the DF case. The VSS signal is used by many controllers such as ECU, EPS, AT, Auto door lock (depends on the country spec), etc and also by the cruise control. Therefore, if VSS fails, you should see CEL and/or other warning lights for the above controllers. Unless you have triggered any of the warning lights AND the cruise control no longer works, it is very unlikely that your VSS has failed. On early model NSX, there are lots of owners suffering from the similar issues. 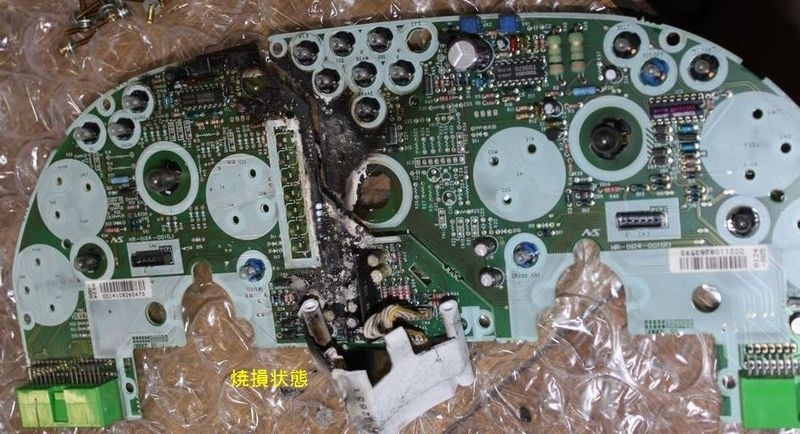 The cause of issue varies from capacitor leakage to soldering crack. From 93 onwards, there were many changes with the pin out and functionality of the circuit boards used for the combination meter so without huge amount of modifications, you won’t be able to use the circuit board that came with the 2002+ NSX-R speedo on your NSX. As you experienced, one will be forced to just use the NSX-R speedo panel/display and keep using the existing circuit board. If the issue happens only when the car (cabin) gets warm, then very likely to be soldering crack. The circuit board warps with the temperature change. Just take a very good look at the board using the Macro mode of digital camera or your mobile phone camera and look for the soldering crack. Capacitor leakage can be found fairly easily if you have serviced the A/C CCU or Bose AMP in the past. By now, on many NSX, the speedo and even the tacho/rpm gauge may have lost their original accuracy. 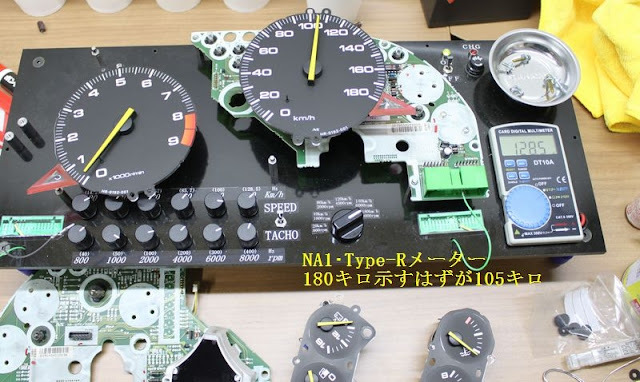 On early model NSX, quite a lot of them are showing a few 100rpm higher reading than the actual engine speed due to the decay of electronics components. Thanks for your advise, i will remove the cluster/clock from the NSX and inspect it careful. I will report back, you always give us great support thanks again! Sorry for the late report. I have my cluster fixed and only have chance to put in back into the NSX about 2 months ago. So far it is working perfectly, it solved the speedo stopping issue and rpm stay high on start up issue. I have replaced all the capacitors on both speedo and rpm circuit board myself. I tried to source the exact capacitors as on the original circuit board but there is about half of the capacitors that it is impossible to find. So capacitors with same capacitance and rated voltage are suitable too (rated temperature shall be at least 85C as most original capacitor rated). Thanks Kaz taking time to reply my email and advise about the capacitors. Big thanks to Kaz!